9 Stunning Light Fixtures You’re sure to Love! Happy New Year! Here’s an exciting lighting collection that celebrates diversity of material, form and texture. From creative fixtures made with resin, plywood, paper and concrete, to designs inspired by a video game, candies, plants & animals, we got you covered. Enjoy and let me know your favs! An impressive and colorful chandelier to grace any dining table. This custom Matawi chandelier is by Emanuel Morez. 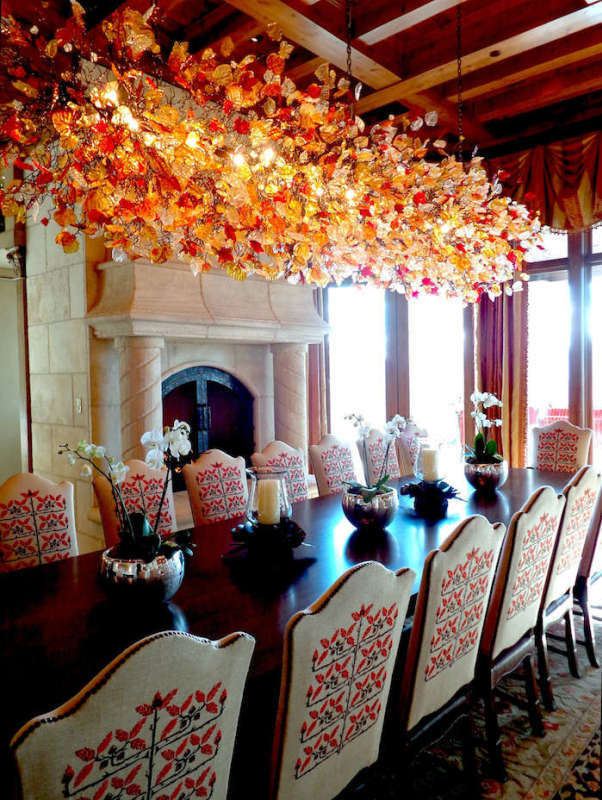 Hand crafted from translucent resin, the profusion of leaves and flowers cast a warm glow over the dining area. 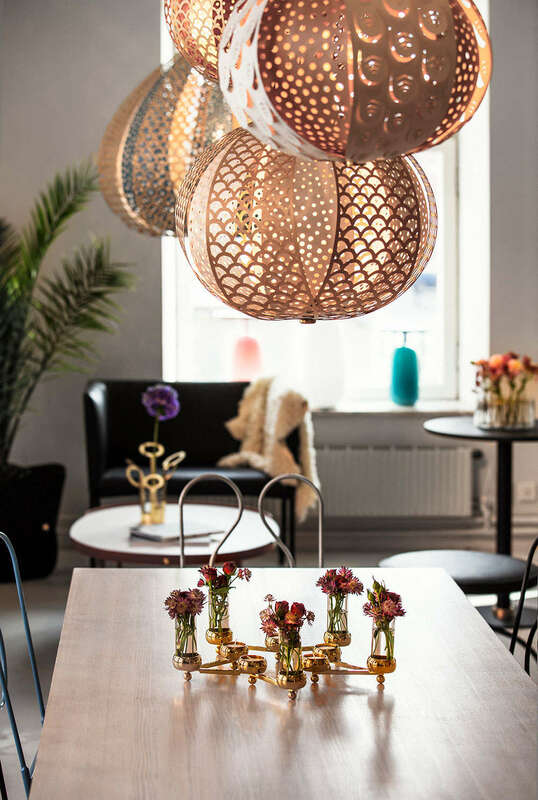 The fixture offers plenty of options – it’s available with LED bulbs or strip lights and can be stem, chain or cable mounted in finishes of silver, antique silver, antique gold and iron. Ethereal lighting in a delicate balancing act. 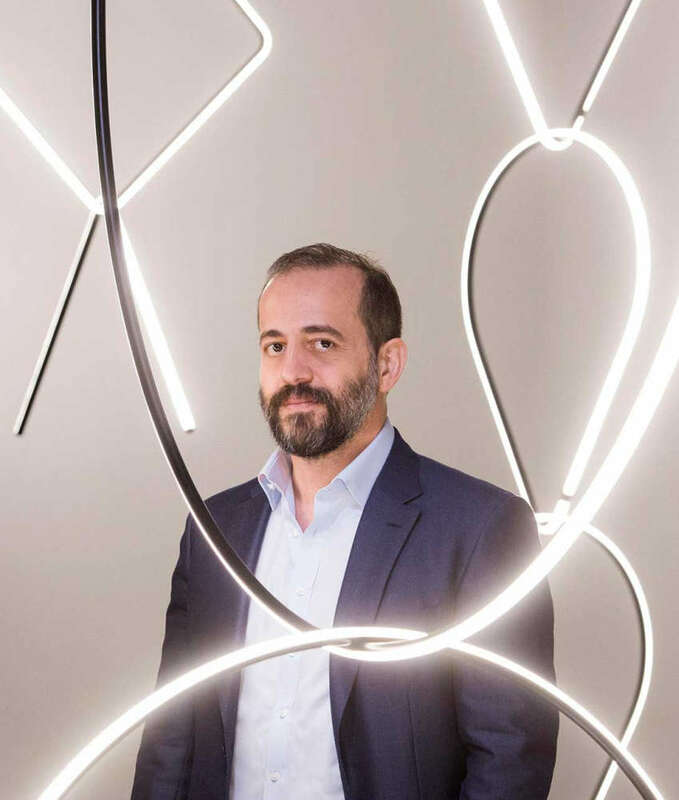 Created for Flos, Arrangements is Michael Anastassiades’ interpretation of lighting as jewelry. He created a modular system where individual lighting components can be hung from the ceiling in any combination. The lighting modules come in different shapes and sizes. Available in circles, horizontal bars, diamonds, teardrops, and right angles, users can link the pieces up in different orders or swap in other shapes as desired up to a maximum of 190 W per fixture. A truly liberating design, customers can freely express their individuality when creating the LED chandeliers or pendants! Can you tell this is a KD light fixture? Made of laser cut aircraft plywood, paper and brass, the lamp consists of 12 petals in 2 layers, which folds up into a spherical-teardrop shape. The Knopp pendant is inspired by a flower bud and is available in 2 patterns, 2 colors and 3 sizes: 22.8” x 21.7”, 17.3” x 14.9” or 15.75” x 12.6”. A glowing ribbon of light. 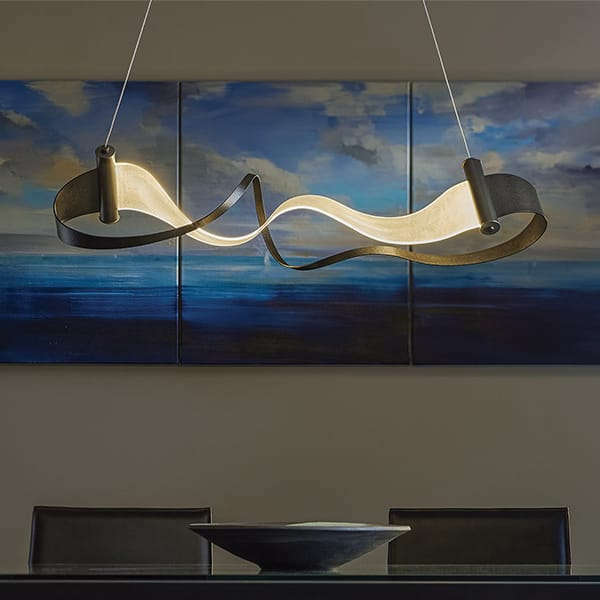 Zephyr by Hubbardton Forge is a marriage of artistry and technology. 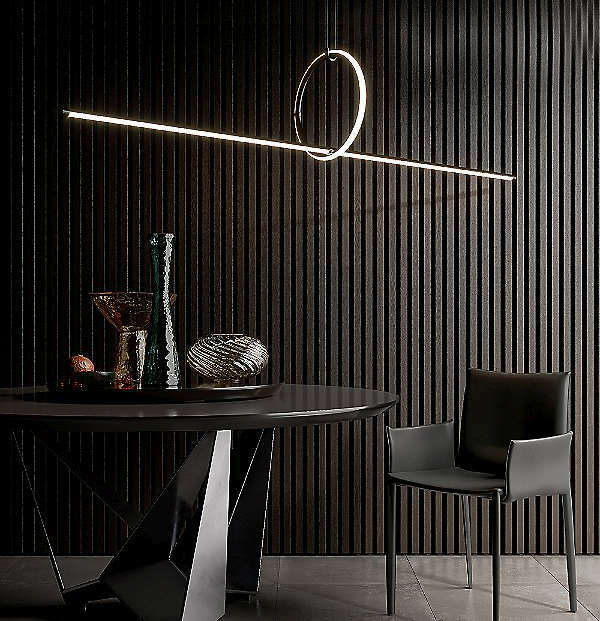 The hand bent acrylic LED light guide merges seamlessly into sinuous waves of forged steel to create a dramatic pendant that is as graceful as it is timeless. At 40” long, the light fixture will be a presence in any space. Another light fixture that celebrates craftsmanship but in a more quirky style. 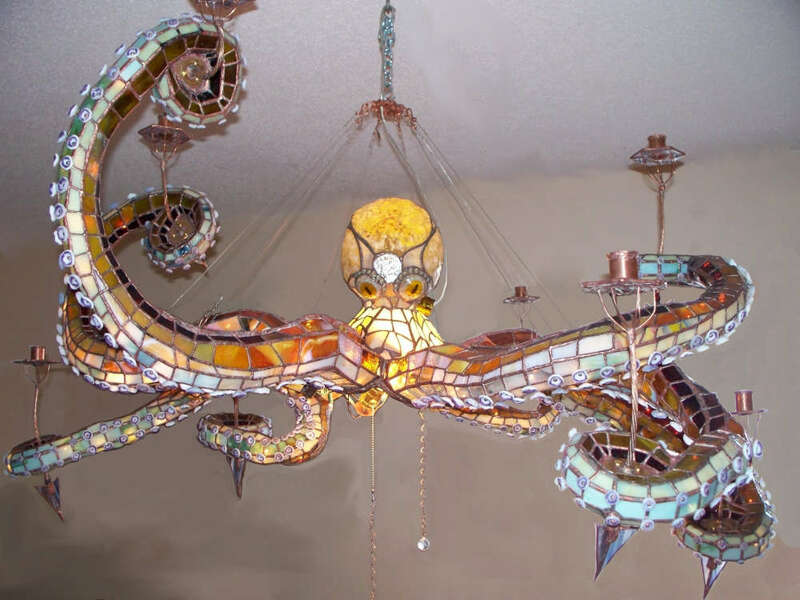 Made of stained glass, this is an equally monumental octopus chandelier that measures 4 ft across with detachable tentacles stretching out to 2.5 ft. Each ‘arm’ supports a copper candlestick holder that terminates into an arrowhead. Since each light fixture takes about 12 weeks to make, it is priced accordingly. If you’re a Jules Verne fan and have $21,000 to spare, this chandelier is for you! 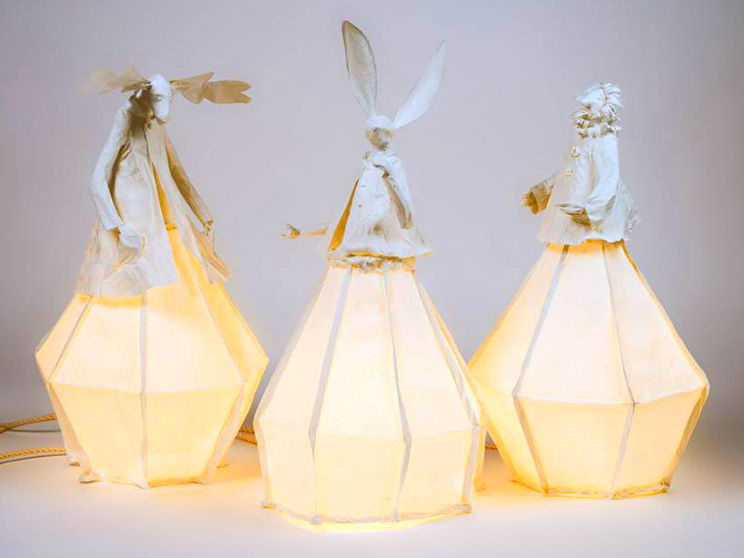 Switching to yet another medium, these enchanting light sculptures are of handmade paper. 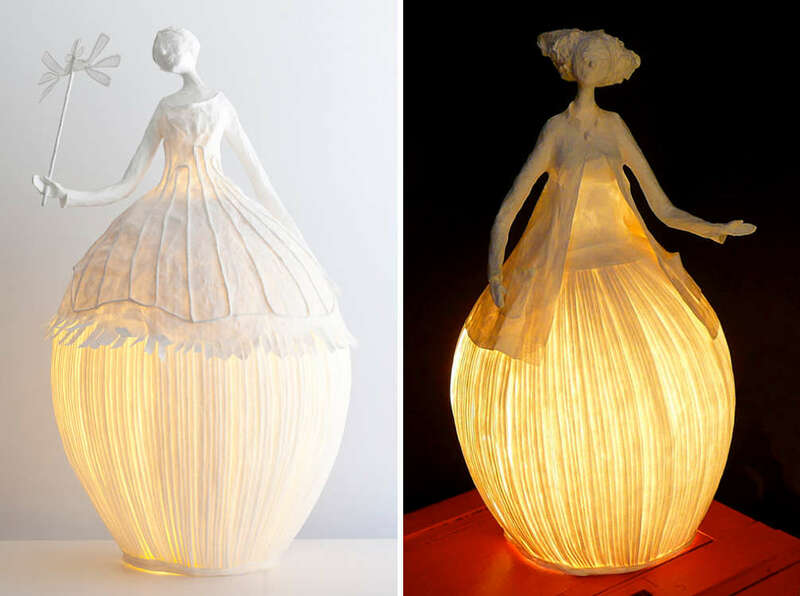 Handmade exclusively using wire, linen paper and natural glue, light sculptures at Papier à êtres are the joint effort of 2 artists: Sophie Mouton-Perrat, who excels in papier mâché and paper folding, and Frédéric Guibrunet, a lamp fabricator as well as master paper maker. In this collaborative effort, Frédéric is responsible for the wire framed lower body and lighting, while Sophie creates the charming figures that go on top. A trio of fantasy animal light sculptures. Rabbits, moose, elephants and other creatures, real or fantasy, are all fair game for the company’s whimsical creations. What’s more fun than hanging giant lollipops over your dining table? 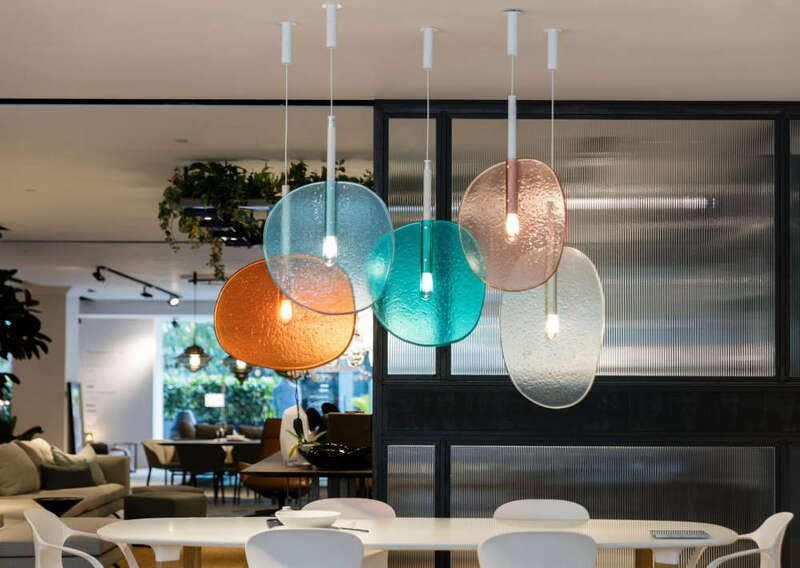 Aptly called Lollipop, the Lasvit collection includes pendant, table, and floor lamps in different shapes and colors. The light fixture is made by integrating its LED light source and metal stem into slumped glass plates. The process of heating and cooling glass produces random aberrations that affect transparency and distortion so optical characteristics of every piece is unique! For those who prefer lighting with a more rugged look, here it is! 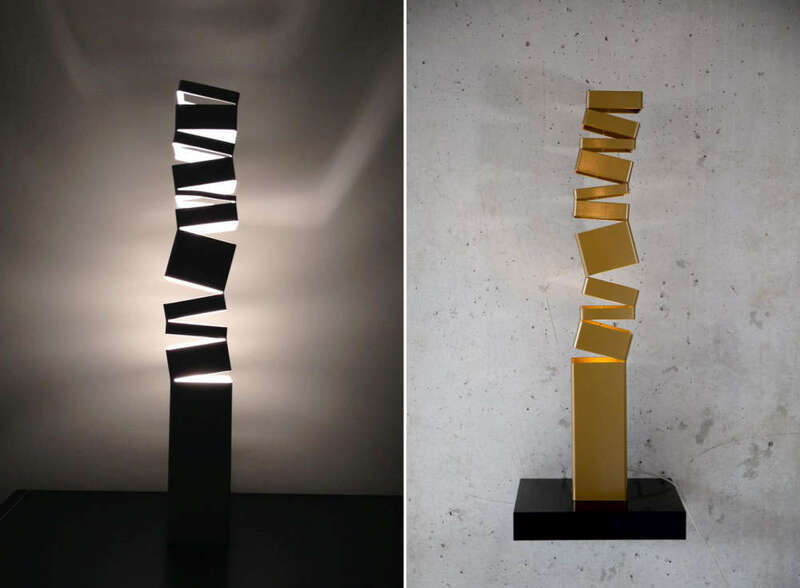 Architect Christian Zahr created this 2-piece table lamp to explore the dynamic tension between positive and negative space, the seen and the unseen, the rough and the refined. 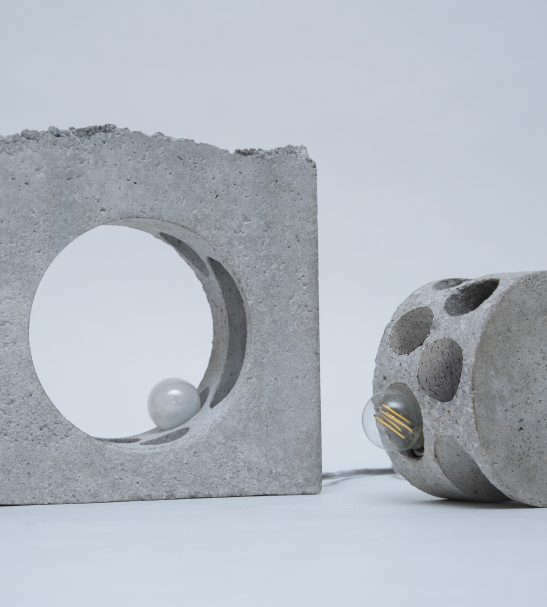 The circular lamp is cut from the square concrete block and a single switch controls both lamps. As a Beirut native, Christian’s choice of materials is a reflection of the city’s brutalist environs. A chandelier that draws a delicate line between light and shadow. The light fixture creates a striking silhouette with the geometric shapes. 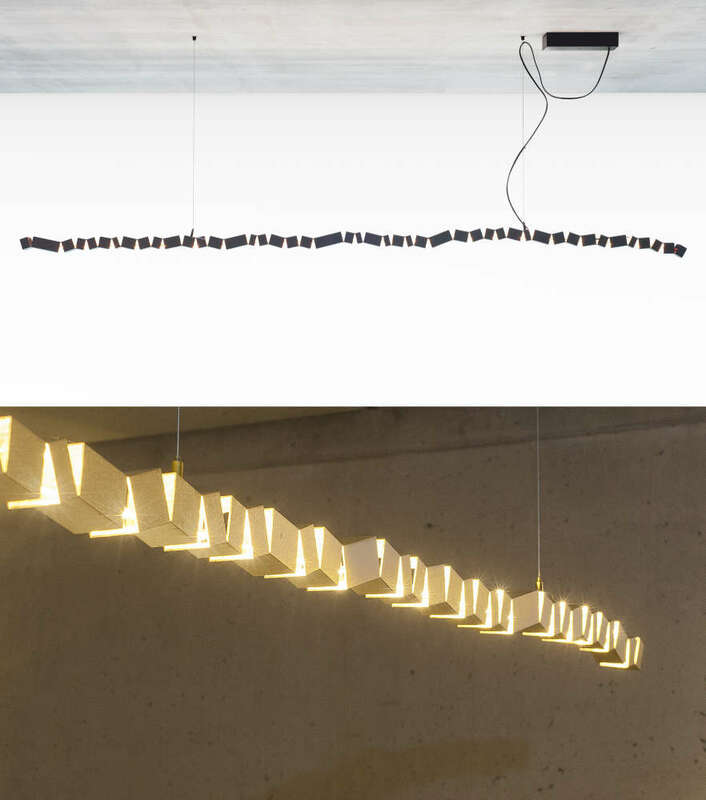 Part of the Tetris collection by Belgian designer Yves Pauwels, the lighting is fashioned out of a 1.5” x 1.5” metal tube that was cut and stretched in his workshop. Available in black, white, or brass, each fixture is custom and can be made to any length from 59”to 158”. Table lamp version of Tetris. In case you wonder who's Interior Design Diva, here's a bit about me. As principal of InterSpace Design, I enjoy space planning, as well as creating interiors that celebrate both lighting and design. I also love to repurpose cherished client possessions and transform them into custom furnishings that are as uniquely personal as they are green. I blog about interior design trends, innovative, eco-friendly furnishings and share sneak peeks of my far flung travels. Come visit my website - I'll leave the light out for you!